Maybe you should also write one yourself, Irene. An inspiration, Susan Deborah! You have me thinking, how do I unload this or that bad habit? What must I do to rid myself of my denial of reality? Well, If I come to really 'know' my failing--which in is truly knowing myself--it allows that particular nagging problem to go away. What is left is the opposite, clear thinking, and a smoother road to good/better behavior. It sounds so easy, when I say that to myself...but it is only simple--not easy! SO THERE! THAT'S what you've done to/for me this morning. BTW, I wish to add one line to your post above. In the closing, write "Joy always"...........hmmmm! Joy always!!! Wishing you joy and more joy, dear Steve. Thanks Glynis. Who can better know ourselves than us. I loved this letter...I too talk to myself and can identify with the 'hurrying' part. These days I am doing nothing, yet, having ample of time at my disposal I am not able to concentrate, and jittery all the time. Perhaps you could write one yourself, Janu. and yes never stop smiling , when you smile the world smiles with you .. I loved the idea but as i said I am not good in this ..
Good things!?!? Along with the good things also come many reprimands. May be I am also Susan and thats why it hit on me hard. thanks for this beautiful piece of encouragement. I know you will not take my comment at the first sight as you had mentioned in your earlier post .. but still this was a real good one. Yes, maybe you are Susan as well. There are many traits that all of us will share invariably. We are all quite same and yet different. Thanks for your lovely comment, dear Tara. Maybe you should try one letter youself. Lots and lots of love and hugs to you Susan,I have been down in the dumps for a long time,and reading this has really inspired me,I will do this also,and I know it will help me. Susan, Your love letter to Susan is so beautiful and creative. :) Love the idea and the outcome, keep smiling. Smiles. Thanks for your words of appreciation, dear Sulekkha. Your letter is an inspiration! Blessing back at you, dear Martha. The hurrying part disturbs me. I need to slow down. Susan, I so much admire your honesty, your willingness to expose your beautiful humanity. Thank you for this. I like you writing prompt. I may do it, not sure if I'll post it, but I do think it's a really worthwhile exercise. Take care lovely Susan. And I agree with your advice to yourself - your time will come. But for now enjoy what is. Thanks Myrna. Sometimes, all I want is to write without thinking of anything. Yes, time will come. I'm waiting. Absolutely loved it, Sus. And although you were writing to yourself, I took home quite a few lessons for me. Love you loads. Quite right. It's a tangible remainder of things that have to set right in me. A letter to yourself, how original! 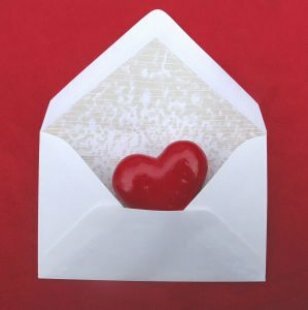 I like the little red heart in the envelope suggesting love for the recipient of the letter . Yes, we should first learn to love ourselves; this will help us love others. The letter is in favor of patience, work, lack of jealosy, smiling, love. That's all good advice worthy to be practiced by everyone. Yes, DUTA, it is in favour of many things that has to be repaired in me. Loving myself comes easily but sometimes I seem to be too harsh on myself. Good to see you here, DUTA. I hope you realize how fortunate you are to be loved (smile). I don't write to myself, but I'm always writing love letters to my wife. I like to leave them in places where I know she'll be surprised to find them. Wonderful expression & thoughts. Thanks for your openness & honesty. Following you in Linky too. Your act of leaving letters to your wife is so very thoughtful. And I can imagine the kind of letters you would write! Thanks for the following. I wonder how Linky works. Susan this is a superb piece... How many of us will have the courage to write a letter to oneself? I am not sure if i could.... It is an honor to be able to read your letter..You may have started something... I know there will be many who will follow your example. Thanks Savira for your thoughtful words. You don't have to write a letter, Sav. All your posts are in a way letters to yourself. Yes, straight from the heart, Ashwini. Sometimes one needs to write letters as these to keep things going. Thanks for coming by. Ah, Zuzana. Many things were weighing down on my mind and as a feel good factor, I thought I would write to myself. Glad that you enjoyed some time away from routine. Welcome here Rajeev. Glad to know that you liked this letter.